As you might imagine, I'm a big fan of the classics. Monet, Renoir, DaVinci, Michi... okay, so the last one is a little more modern as it's of the art nouveau era, but still. The fact is that in the world of budding artisans and creative enlightenment, many of us forget to look back and appreciate the talents of those that came before us. What I noticed about today's shop is that they have an appreciation for this history as well and it shows not just in many of the designs in her shop but also in the fact that she actually features some of these historical pieces in her jewelry. Maria Bella Jewelry is filled with pieces that she describes as a "contemporary vintage look". 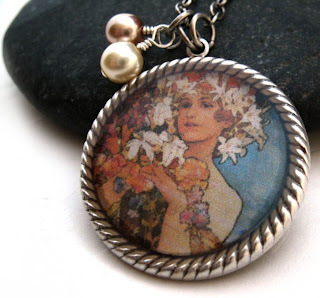 This is a style of jewelry I'm particularly fond of. She works with silver, gemstones, crystals, pearls, glass and wood beads, combining them with a number of different metals and textures to create a number of very pretty, feminine and unique pieces. YOU CAN CLICK ON THE PICTURE ABOVE TO VISIT MARIABELLAJEWELRY ON ETSY AND TAKE A LOOK AROUND OR, IF YOU PREFER, CLICK RIGHT HERE.